ISLAMABAD: The government revealed on Sunday that authorities had traced several bank TTs (telegraphic transfers) used by the Sharif family for money laundering. At a hurriedly called press conference, Information Minister Fawad Chaudhry alleged that if there was one family that had marked the beginning of modern-day corruption in Pakistan, ‘it is the Sharif family’ while the Zardaris carried it forward to new heights. 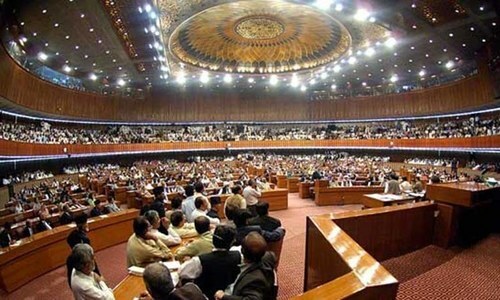 Flanked by Hammad Azhar, minister of state for revenue, and Shahzad Akbar, special assistant to prime minister on accountability with the status of minister of state, Mr Chaudhry alleged that 200 bank TTs related to the Leader of Opposition in the National Assembly Shahbaz Sharif had been traced. “Seventy persons have been identified in this regard,” the information minister said and showed the copies of bank documents related to money transfers in dollars and UAE dirhams. The details of the alleged money trail were presented to media showing that the two political families had been instrumental in siphoning off ill-gotten money from the country and part of it was invested back in the country through various accounts. He said all banking transactions were conducted before 2008 when the anti-money laundering law was not enacted in the country. Mr Akbar said Opposition Leader in the Punjab Assembly Hamza Shahbaz had not answered a single query put by the National Accountability Bureau, but he was issuing misleading statements through the media. “The truth of this saying is reflected clearly in the way money launderers are treated and the way they behave with indignation when questioned,” Mr Khan added. At the news conference, the information minister claimed that from the end of 1988 to the beginning of 1990, the Sharifs had accumulated a lot of wealth, but the challenge for them was its utilisation and “how to manage it and make it white so that it can be invested in Pakistan or anywhere else”. He claimed that the authorities had unearthed suspicious transactions made between 1996 and 1998 when foreign remittances of Rs850 million were credited in the account of the Hudaibya Papers Mill, which had a total paid up capital of only Rs95m. “The owner of the mill was Mian Mohammad Sharif and his late father,” Fawad Chaudhry said and alleged that the ill-gotten money was sent abroad through hawala/ hundi. He said the Economic Reforms Act-1992 was introduced to facilitate the inflow of dollars into the country, but the law was used by the Sharifs for outflow of their ill-gotten money through banking channels. “The money was deposited in fake accounts to send it abroad too and some portion of this money returned to Pakistan through banking TTs in the accounts of 40 individuals, all of whom were associated to the Sharifs, some of them distant relatives,” he said. Mr Chaudhry described former finance minister Ishaq Dar as ‘economic hit man’ for the Sharif family, saying he was the architect of the Economic Reforms Act-1992 and “devised the novel method for money laundering through fake accounts”. He said Mr Dar had recorded a statement before a magistrate under oath in 2000, in which he confessed to have forwarded Rs1.24 billion trough hundi/ hawala, “but the case could not be pursued due to NRO leading to presidential pardon”. “The Hudaibya money transfer was replicated in the Hill Metal company case too,” Mr Chaudhry alleged. He said Hussain Nawaz sent around Rs1.16 billion through TT to his father Nawaz Sharif and out of it Mr Sharif gave Rs820m to his daughter Maryam Nawaz, who bought agricultural land from the amount. “Similarly, Shahbaz Sharif has two properties in London but nobody knows the source of financing and how did that money land in the UK,” the information minister said. 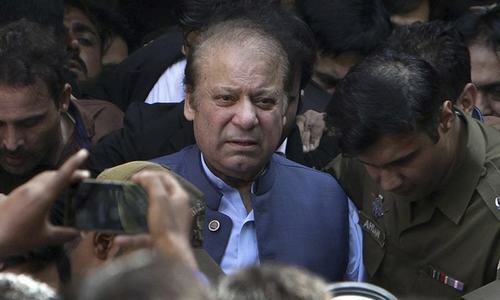 When questioning started in October 2018, the key members of the Shahbaz Sharif family, including his wife Nusrat, son Salman, daughters and son-in-law Ali Imran, gradually left the country, he said. The minister said PPP leader Asif Zardari took corruption to a new height as he bought an entire bank. He alleged that an entire network was created in Sindh where fake accounts were created and then money was transferred to people “such as the man who sold falooda (an ice cream dessert) in Faisalabad and saw millions of rupees transferred to his account”. “Money was transferred to insignificant people such as gardeners, drivers, guards, etc. If big amounts are passed out to these people, their accounts must have been used by others,” said the information minister. He said the Federal Investigation Authority had unearthed around 500 accounts which were connected to 32 basic accounts that branched out to the others. “Everything was traced to these accounts such as payment for Bilawal Bhutto-Zardari’s air travel expenditures, Ayan Ali’s air tickets and the expenditures incurred on Bilawal House. Moreover, Bakhtawar Bhutto-Zardari’s birthday expenses were also paid through these accounts,” Mr Chaudhry said. He said the Zardari family used Omni Group, contractors, Public Sector Development Programme funds of Sindh, human carriers (referring to Ayan Ali) and fake accounts for gathering ill gotten wealth and money laundering. Irrefutable evidence. Sharif family can't claim bank records are fake, especially those SWIFT messages. Sharif family is in grave danger it appears. It is a great mess created by these two families how to solve this jigsaw. If the proof is so strong, why is it presented by the state ministers on TV and not in the court by the prosecutors? This too shall pass... Press conferences are easy - providing proof that'll hold up in a court of law is the real challenge. Sounds like another round of slander and media trial. Investigate the whole family. Convict them, and jail terms need to match the magnitude of corruption, and no need for bail. Issue red warrants for absconders through Interpol. @salman, these tricks tees and hypocrites love their jobs so much, power and corruption. They planned all this, so moved kids abroad. Certainly none of them is a Sharif.